Orson Welles’ 1938 radio broadcast of HG Wells’ War of the Worlds caused panic among certain audience members. News reporters repeatedly interrupted what appeared to be a typical evening of music programmes, to deliver eye-witness accounts of invading aliens. Some listeners had not realised that it was a drama and believed Martians really had landed in New Jersey. This is the starting point of Rhum and Clay’s multi-layered production. Aided by an ingenious sound design from Benjamin Grant and evocative lighting by Nick Flintoff and Pete Maxey, the four-strong ensemble imaginatively recreate Orsen Wells’ live broadcast. 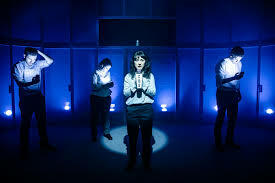 Isley Lynn’s play is a clever exploration of the enduring fascination of sci-fi, conspiracy theories and the thin line between imagination and reality. It’s also a salutary warning against the ubiquity of fake news. The parallels between HG Wells’ classic, Welles’ thrilling adaption and new media are perceptively teased out.